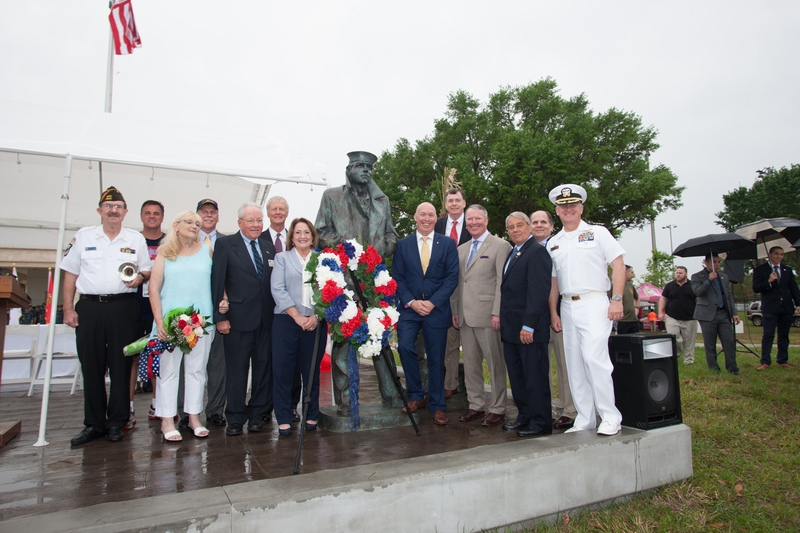 Orange County Mayor Teresa Jacobs and community leaders honored veterans and active military personnel at the dedication ceremony of the Lone Sailor Navy Memorial of Central Florida on Saturday morning. The Central Florida Navy League (CFNL) coordinated the ceremony which drew residents from across the region. Mayor Jacobs provided her remarks at the ceremony and was joined by Congressman Dan Webster, City of Orlando Mayor Buddy Dyer, Orange County District 4 Commissioner Jennifer Thompson and City of Orlando District 3 Commissioner Robert F. Stuart. The new memorial at Blue Jacket Park in Orange County is located at the former home of the U.S. Navy Orlando Naval Training Center, which closed in 1999 and was later redeveloped into the Baldwin Park community. In 2009, a community effort was initiated to honor the courage and sacrifice of those who began their naval careers in Orange County. Nearly $450,000 was raised for the Lone Sailor Memorial, with Orange County Government contributing $100,000 towards the monument. The monument is the 14th Lone Sailor Memorial in the nation and the first to be placed on former Navy grounds. According to the CFNL, more than 650,000 sailors trained at the Orlando Naval Training Center, which contributed greatly to Orlando’s economy. The Lone Sailor statue was created by Stanley Bleifeld, a Navy veteran of World War II, and contains two pieces; the Sailor, who stands 7 feet tall and weighs approximately 1,000 pounds, and his sea bag and cleat weighing 700 pounds. As part of the casting process, the bronze for the Lone Sailor was mixed with artifacts from eight U.S. Navy ships. The Sailor looks directly into the “grinder,” or the drill field, where recruits marched, trained and eventually graduated. He also looks towards the site where the USS Blue Jacket training ship was once stationed for many years. Photos from the ceremony may be found on Flickr for use by the media.